Homestead Declaration form. Risk Free. Save Time And Money. Allows homeowners to protect at least part of the value of a dwelling against most creditors' claims. By signing a legal document known as a homestead declaration, homeowners can protect at least part of the value of a home against most creditors’ claims. In short, a homestead can help you avoid losing your home to creditors. By definition, a homestead is the house or mobile home that a person lives in and land on which it sits. The property must be a person’s primary residence for it to be eligible for a homestead declaration. The term homestead also includes any improvements to the land, such as a fence. What is a Homestead Declaration? A Homestead Declaration – sometimes switched to “Declaration of Homestead” – is a legal document in which homeowners take advantage of state statutes providing for the protection of families living in the homes. The statutes protecting a homestead will vary from state to state, but generally they help provide for a family’s protection against financial troubles in paying for the homestead and financial troubles as a result of the death of the head of the household. In short, homestead law can help you avoid losing your home to creditors. Homestead Declarations can be very easy, simple, and straightforward. They are generally not difficult to fill out and file – and, once filed, generally do not require renewal in the years afterward. The government already knows I’m a homeowner. What’s so different about a “Homestead”? As a homeowner, you will be entitled to certain tax considerations simply due to the way the tax code is written. The advantages of filing your home as a “Homestead,” however, will be different. While the federal government may know that you’re a homeowner, filing your home as a “homestead” allows the legal system to see that you’re raising a family in that house. In certain states, this special “homestead” status then carries along certain legal protections because of the considerations of raising a family. Why should I file a Homestead Declaration? You may not need to. But if a Homestead Declaration allows you to take advantage of statewide protections for your family, you may find the small investment of time to be well worth the effort. The specific statutes that offer protections to homesteads vary from state to state. It’s important for you to look up your own state’s laws for Homestead Declaration and see if it might be beneficial for you to do so. Who doesn’t need to file Homestead Declarations? If you already own a home and your state does not offer any special protections for a homestead, then there is no real need to file this declaration. Additionally, if you own a property that has no need or even grounds for this special protection (for example, if you own a rental property), you should not seek the benefits of running a homestead. It’s important to use common sense in determining whether or not you should file a Homestead Declaration. What kind of protections are common under Homestead Declaration? Although this information comes with the usual caveat that each state’s protection will vary, there are some common protections that you’ll see as a result of declaring your Homestead. Another protection generally offered under homestead declaration relates to financial ruin. It may be required in some states to liquidate your assets for certain financial protections; if you have declared a Homestead, it may follow that you will not necessarily need to lose your home as a result of your financial situation. For more information, be sure to check on your state’s own protections – those are the only protections that will ultimately matter to you and your Homestead. What Homestead Declaration form should I download? If you’re downloading a Homestead Declaration form from the Internet, you should make sure that you’re using the right one. Some variables exist in Homestead Declarations that you shouldn’t ignore. For example, a Homestead Declaration for Couples will differ from a Homestead Declaration for Single Persons. Additionally, you should download only the form that is relevant to your individual state. What is contained in a Homestead Declaration? Parties: Identifying the parties involved. You’ll identify who’s declaring the homestead, typically stating whether or not you are filing one as a couple or as a single individual. Property Location: Identifying the property being declared as a Homestead is important, so you’ll be expected to not only identify it but list its address as well. Declaration: This is the “meat” of the form, in essence the provision that makes it a lawful declaration. Signatures: Once you’ve signed this declaration, you’ll have to be able to demonstrate that the declaration you’ve made is truthful. If you’re confused about how a Homestead Declaration will look, it is not difficult to find a sample form to view online. When is a Homestead Declaration valid? Once signed and filed. A Homestead Declaration carries legal weight, but the requirements for its validity are not subject to as many variables as a contract or legal agreement might be. Even so, it’s important that you fill out a Homestead Declaration fully and accurately. When it comes to legal forms these days, people generally have at least one of two questions: what on earth is the legal form you’re talking about, and how can I use it to my benefit in a bad economy? With our sluggish economy, FindLegalForms.com is finding that a lot of people are asking both questions these days. That’s why we intend on answering both as it pertains to homestead declaration forms in the length of this article. First, we need to define homestead declaration forms. Essentially, a homestead declaration form is a form you use to protect your real estate – your home, in other words – during times of economic hardship. It accomplishes this by separating your home from your assets in a sense, thus denying creditors the ability to claim your home in certain cases. Keep in mind that this applies to a number of states, but not all states. 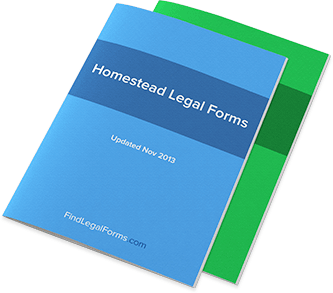 In the states where homestead declaration forms have a tremendous amount of power, you’ll want to take the time to download and file these forms just as soon as possible. Protecting your home is essential in a sluggish economy, of course. Foreclosures are sky-high and home prices are low, which means double trouble for someone who owes money. People sometimes pay debts by having their homes taken from them – and when a home is valued as less than the usual price (as it might be during bad economic times), this means that their personal financial crisis actually doesn’t cover as much as it usually could. The goal, of course, is simply to protect your home as much as possible so that you don’t have to move out simply because you owe someone money. The government can offer certain protections on your home, but you need to declare exactly where this homestead is – which is where the declaration form comes into play. Once this is filed with the government, you’ll have additional protections on your assets that you didn’t have, simply because you took the time to download the form and file it. While lawyers can help you with this process, it’s generally easy to handle a homestead declaration form on your own time. With the convenience of sites like FindLegalForms.com, doing so has never been easier. The more you’re educated about how legal forms can help you, the more powerful an individual you will be. Your assets can be protected from an incidence of divorce. Your homestead can be declared, thus granting you certain protections. You can have your estate cared for along with a range of other personal options that you can’t get if you simply choose to ignore the power of many legal forms. The beauty of today’s Internet is that you can simply download and print off these legal forms, having them filed with a minimal invasion to your time – and, of course – your bank account. In tough economic times, that sounds like good news.